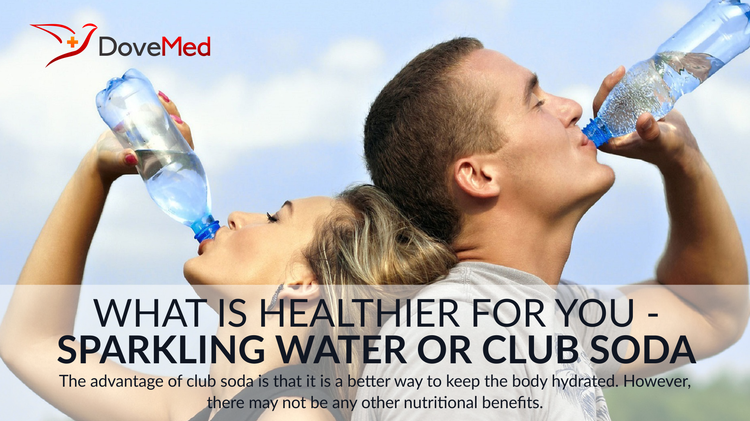 What Is Healthier For You – Sparkling Water Or Club Soda? Club soda is carbonated water to which minerals and mineral salts have been added to improve the taste. In comparison to plain water, the sodium content of club soda is often higher. Sparkling water refers to either tap water that has been carbonated with natural or manufactured carbon dioxide, or it can refer to water drawn from a naturally effervescent source with carbon dioxide being injected into the water during bottling. Club soda (12 oz.) contains 18 mg calcium, 4 mg magnesium, 7 mg potassium, 0.04 mg iron, 75 mg sodium, 0.35 mg zinc, 0.021 mg copper, and 0.0004 mg manganese. It does not contain any calories, carbohydrates, fat, sugar, protein, or fiber. Sparkling water (1 oz.) contains no calories, fat, carbohydrates, protein, vitamins, or minerals. The advantage of club soda is that it is a better way to keep the body hydrated, since it has more minerals than regular water. However, there may not be any other nutritional benefits. A study published in the Journal of Oral Rehabilitation in 2001 suggested that drinking carbonated water is a safer alternative for teeth, as compared to drinking juice or sugary sodas. There are also some reports on a nutritional downside to drinking soda waters - they are said to prevent calcium absorption and increase the risk of developing osteoporosis. However, there is no evidence that drinking carbonated water harms the bones. An association has been found between carbonated cola drinks and low bone mineral density. But, the same does not hold true for non-cola carbonated drinks. Carbonated waters are usually calorie free, but it is advisable to check the label before taking them. For added flavor, a hint of lime or lemon can be squeezed in. Thus, the jury is out on whether club soda drinks are healthier than sparkling water or not. More research is required to determine which variant of carbonated water is healthier to drink. Bullers, A. C. (2002). Bottled water: better than the tap?. FDA Consumer [Internet journal], 36(4). Studlick, J., & Bain, R. (1980). Bottled waters-expensive ground water. Ground water, 18, 340. Greenleaf, J. E. (1994). Environmental issues that influence intake of replacement beverages (pp. 195-214). Fluid Replacement and Heat Stress. Washington, DC: National Academy Press. Segel, E. (1960). U.S. Patent No. 2,942,978. Washington, DC: U.S. Patent and Trademark Office.